ZeTime: the world’s first hybrid smartwatch combining mechanical hands with a round color touchscreen. Using groundbreaking technology to mount watch hands through the center of a TFT color display, ZeTime blends the classic design of a traditional timepiece with the most advanced features of a smartwatch. ZeTime proprietary ‘Smart Movement’ technology enables its always-on hands to function for up to 30 days with a single charge, ensuring the primary function of the watch -to tell time -is always running. With just a quick glance, stay up-to-date with what matters to you. 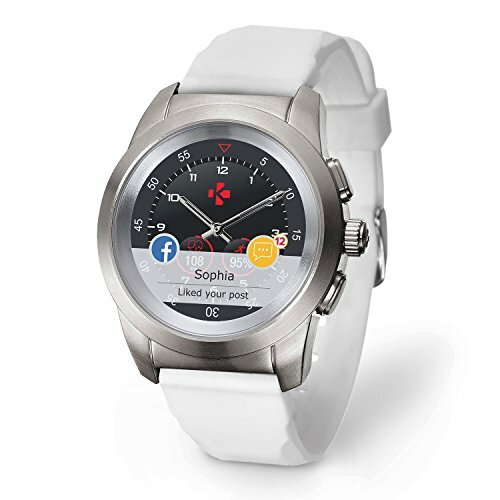 ZeTime displays notifications of incoming calls, emails, SMS, social networks, calendar events and all your favorite apps. When opening up notifications the watch hands move horizontally to maximize content visibility and readability on screen. Equipped with a 3-axis accelerometer and an optical heart rate sensor, ZeTime tracks your daily activity, your sleep pattern and monitor your heart rate throughout the day, allowing you to keep an eye your performance. Its inactivity alert detects if you have been inactive for too long and encourages you to move with a gentle reminder. With ZeTime, users can control their phone’s functions right from their wrist: view incoming calls, check weather forecasts, play music, take a photo, and more. Created to fit all styles, ZeTime’s elegant aesthetic features a sleek stainless steel watch case, sapphire glass, and a variety of interchangeable digital watch faces and bands. ZeTime seamlessly connect to iOS and Android smartphones by Bluetooth. Download the free app to set up your smartwatch, sync your activity and sleep data, choose the notifications you want to get at your wrist, download exclusive watch faces and more!